This well appointed house is well equipped, in a quiet and peaceful location yet easily accessible. It enjoys panoramic views of the Cromarty Firth. Enjoy the Firth views directly from the house. Inverness is only a 20 minute drive. Enjoy beautiful walks through woodland to the Novar Estate crossing the Black Rock Gorge bridge and it's waterfall's. 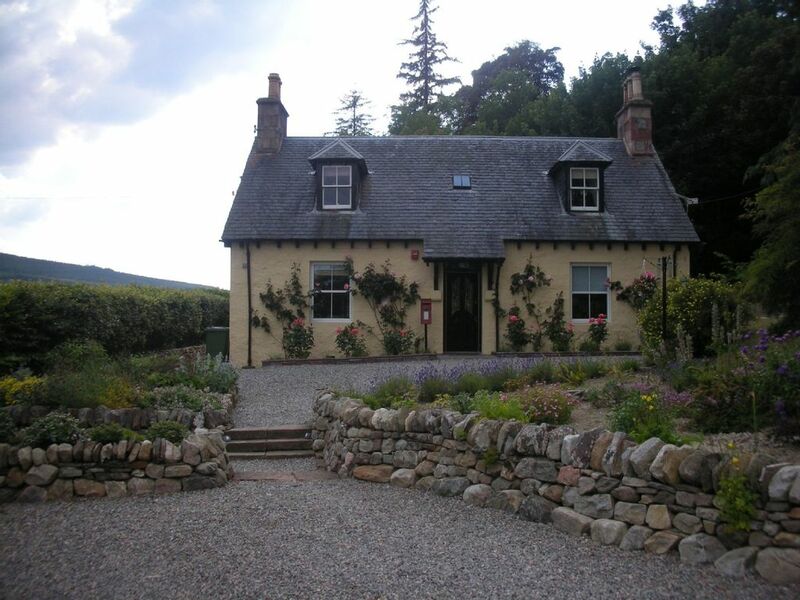 An attractive house set on its own, with beautiful natural garden and large woodlands. Excellent places to eat locally. Local shop 4 miles. Hotel/restaurant within 15 minute walk. Situated near a small village with the sea to our front and forests and hills to our rear, we are also close enough to places like Loch Ness, Royal Dornoch Golf Course, and an abundance of local whisky distilleries including The Glenmorangie. Had a very peaceful time in the excellently equipped house. Lots of nice walks close by, and interesting things to see. Have no negative comments at all. Would go again. The West Lodge is a beautiful house and so well equipped! Nothing was missing, and the contact with Roland was very good as well. There is so much to do and see in the area. We highly recommend staying there! Westlodge is the perfect get away in the Highlands. Our entire family met there for our annual reunion and we could not have been more pleased. The house is gorgeous and so is the area. You will not be missing anything since Westlodge is so well equipped. The location is perfect for day trips and there are endless places to visit and explore. The contact with Roland was great. I hope we will be able to come back one day and I would highly recommend staying at Westlodge! We made memories there that will last us a lifetime. Beautiful house, very well maintained inside and out. Equipped with everything we could possibly have needed. Would recommend. Wir waren zum 2. Mal in Schottland und auch zum 2. Mal im Westlodge Cottage. Es ist sehr liebevoll eingerichtet, hat Charme und ist der perfekte Ort zum Wohlfühlen. Der Wintergarten ist für uns dieses Mal neu gewesen und hat sich gleich als neuer Mittelpunkt des Hauses etabliert...besonders da man jeden Abend zur selben Zeit Rehe am Hang beobachten konnte. Idylle pur! Der Kontakt mit Roland war sehr angenehm und unkompliziert. Wir können nichts beanstanden oder Verbesserungsvorschläge machen...es fällt uns nichts ein! This was our second stay at West Lodge and we were delighted to be able to return. Since our last visit, a large conservatory has been added with a wood burning stove to keep us warm in the evenings. Our two grand daughters loved playing in the huge gardens and going to visit the horses in the next field. The kitchen has every amenity which you could hope for and the house in general is well equipped. We hope that this will not be our last visit here. Whilst staying in the Highlands, there are various outdoor sporting activities, fly fishing, clay pigeon shooting, golf, walking, stalking in season and walked up grouse, pheasant and duck shooting. Loved by millions throughout the world, Golf is a game that was born on the links land of eastern Scotland, for over 600 years the Scots have natured the game and today, as it has always done, gold is regarded as the game of the people. The popularity of golf was so much so that during the mid-15th century when Scotland was preparing to defend itself against an English invasion, the population’s enthusiastic pursuit of golf led to the neglect of military training such as archery practice. This unwanted distraction led to the Scottish parliament of King James II to ban golf, the ban lasted from 1457 until it was lifted in 1502. Today Scotland is regarded as the home of golf and has almost 500 courses many of which are survivors from the very earliest. Golf: Nairn Golf Club, this Traditional Scottish Golf Links Course was created form a wilderness of whins and heather and talents of professional and amateur alike. Nairn’s truly remarkable feature is that from every hole you can see the Moray Firth and the golden colouring and changing lights of the Black Isle. Even more extraordinary – only too easily you can strike the ball into the sea on every one of the first seven! Tain Golf Club in Ross-shire, a traditional Scottish Highland links course designed by Old Tom Morris, situated 9 miles south of Dornoch and 31 miles north of Inverness. Our Championship length links enjoys spectacular views over mountains and sea and benefits from a sheltered climate, which allows favourable golfing conditions for most of the year. With our 3rd hole rated as one of the best 18 links holes in Scotland and our 17th acknowledged as one of the top 18 holes designed by Old Tom Morris, we believe that Tain offers one of the finest settings and challenges for a round of golf. Inverness Golf Club, situated one mile from the city centre and only six miles from the airport, provides an excellent test of golf for all levels of player and a great alternative to the traditional links courses. Visiting golfers are most welcome to play the 6,256 yards par 69 course. There are two Bars and a Restaurant. Visitor locker rooms are available with shower facilities provided for both males and females. Handicap certificates are required. Ski: Aviemore is the outdoor capital of the Cairngorms. It firstly developed as a ski resort and both the Cairngorm and Lecht areas have a range of pistes suitable for snowboarding and skiing. Being surrounded by the Monadhliath and Grampian mountains there are plenty of Munros, hillwalks, climbing opportunities and low level walks to suit all abilities. The rivers in the area provide excellent opportunities for kayaking and canoeing trips. There are a wealth of outdoor companies based in Aviemore for equipment hire or courses. 25% deposit required to confirm reservation and balance due 7 weeks prior to arrival. We require the full amount for bookings made within the 7 weeks of arrival.